Ailsa has set a challenge this week that I couldn’t resist. I love street markets, well any market really 😉 this is taken at Rahba Kedima in Marrakech. It’s a wide square with little shops around the edge selling spices, caged birds, turtles and Argan oil – my main purchase. You can also find all you need for black magic should you so desire! Herbs, leeches, dried scorpions and other bizarre unmentionables, its all here. 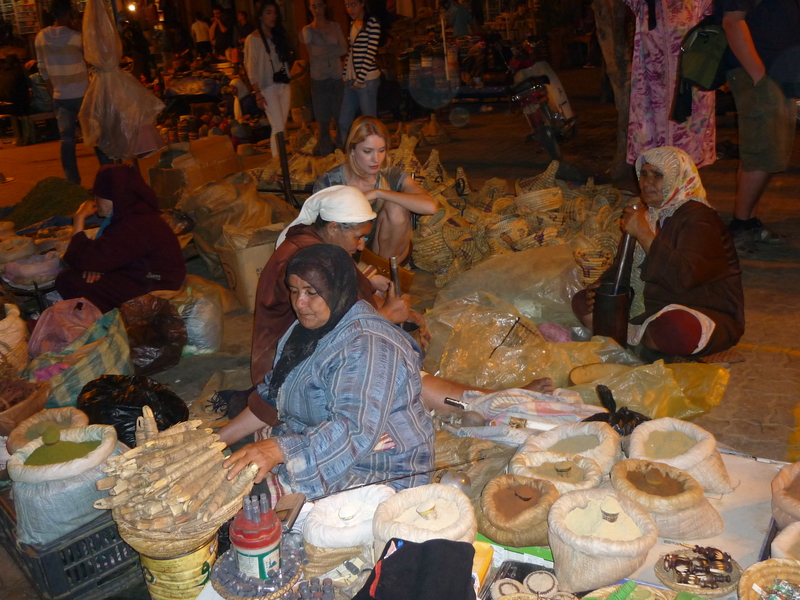 The centre of the square is occupied by Berber women selling their crafts, baskets of all shapes and sizes and knitted hats, sitting on the ground. I bought several warm, brightly coloured hats, with the intention of wearing them in winter but haven’t so far, there’s a surprise. The women are there until very late at night and are quite pushy with tourists, I imagine they have it pretty tough. These are the spice girls. Haha, good answer! Must try Argan on my hair now, thanks for the tip! Argan is for all of the body and hair, its just beginning to be used in the UK etc – discovered as Shea butter was, just hope no-one gets ripped off in the process! Lovely photo for the challenge. Yes, Marrakech is very different and exotic. Thanks, I love it there, been twice and would love to go back! Cool! I want to see it! And hear, smell and taste it! Great post Gilly. The first thing I thought was I wish I could sit cross-legged like that! Love all those wonderful spices. Even when I did yoga I couldn’t do a cross leg for long! Gilly, you’ve been to so many fantastic locations!! Love this!! maggie came back from her year around the world with marvelous stories of street markets throughout asia and indonesia! definitely will forward this to her! Marrakech is an easy one from the UK, not too expensive and the nearest place for some winter sun. Asian markets are awesome! I’ve been hearing about Argan oil lately but nothing of substance and then there’s the worry about getting ripped off. The photo of the market is fabulous. I can smell all those spices. Mmmm. I heard recently of a local hairdresser selling it for about £20 a bottle, the same size as I bought for around £2.50 and it makes me cross that the profit goes to the wrong people. I enjoy your look at life so much that I have nominated you for the Illuminating Blogger Award! Visit http://foodstoriesblog.com/illuminating-blogger-award/ to find out more. I don’t think there was any music in Rabha Kedima but in Jemaa El’fna by night there is all sorts going on! It is an everyday event and very vibrabt. Prices? well not the cheapest but okay, haggling is part of the game of course but fun 🙂 I love Marrakech! full of atmosphere, i can almost smell the spices and feel the air of the market! Christine you would love it, it’s right up your street! I use Argan oil in my own and my daughter’s hair. I buy it at our local chain drug store, so it’s nice to get a glimpse of the world it really comes from! Also, is the woman in front (wearing blue) selling some kind of flute? Ah I’ve never seen it here except as an ingredient but someone told me that hairdressers are starting to sell it,very expensively! I’m told it only grows in Morocco and Mexico. I’m not sure what she is selling but no they aren’t flutes. If you click to make it bigger it looks like a reel of some sort of fibre? Wicker for baskets? I love it too and would love to go a third time! was easy when I could fly from Bristol for a few days! It would have been perfect if we’d been allowed out of the transit lounge ……! And there was no piano unfortunately as I’m sure one of us would have attempted to play! Finally, we get to meet the real “spice girls.” Love the street markets. There also full of fun surprises that we don’t see in groceries. A wonderful photo depicting real life. Have a blessed day. wonderful shot. there’s so much captured in the shot, almost like a dance. Fabulous image – Spice girls – I love it!